“Hip” isn’t the first word that comes to mind when we think of Las Vegas. Yeah, the Cosmopolitan tries hard, and there’s a number of legitimately cool spots to hit up in Vegas proper (which means journeying off the Strip), but when we think of the major casinos and restaurants that dot South Las Vegas Boulevard, we don’t exactly see places trying to attract the Williamsburg or Silver Lake crowd. We think of classy gourmet eateries like Joël Robuchon at the MGM Grand and Guy Savoy at Caesar’s, touristy spots like Guy Frieri’s Vegas Kitchen and Bar, or even the fast food courts found at the more family friendly resorts. We don’t think of a restaurant like Best Friend, food truck king Roy Choi’s new concept at the Park MGM resort, and yet we can’t stop thinking about it after a recent meal there. At first Best Friend looks like a bodega in Koreatown, incongruously plopped down inside a Vegas casino. 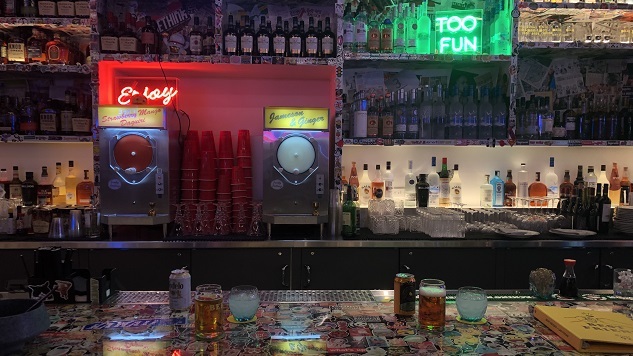 The front room walls are covered with junk food, condiment bottles and household goods typically found in convenience stores, with a bar on one side serving up alcoholic slushies. Posters of California icons Tupac, Magic Johnson and Fernando Valenzuela adorn a corner near the bar. A checkout counter sells both the stuff on the walls and also a variety of Best Friend-branded merchandise, including a Satin jacket, if you want to feel like an ‘80s youth sports coach. If you didn’t know it was also a restaurant, you might think this front room was the whole show, either an out-of-place corner market or a very detailed and realistic art installation. One of the walls isn’t what it should be, though. There’s a passage way to a back room where the drink cooler would normally be, and it’s here where you’ll find the real Best Friend—a large, open room with a bar on one side, an exposed kitchen on the other, and a DJ booth in the corner, with tracksuit-wearing waiters and busboys in bucket hats taking care of the tables. Large sketches of smiling faces stare at you from the walls, representing important figures in Choi’s life and career. The eclectic mix of classic hip-hop, pop remixes and the occasional rock song doesn’t sound like your typical Vegas restaurant or club. (Although we could’ve done without that Weezer cover of “Africa,” which we’re pretty sure we heard while dining there on a recent Friday night.) It’s a warm, inviting space with a communal feel, like an open office but where your only responsibility is to eat good food. It’s hard not to eat well at Best Friend. The menu is full of the kind of Korean-Mexican fusion that Choi made his name on. Our meal started with a selection of banchan, small bowls of tangy kimchi and spiced spinach, cucumbers and sprouts that prepared us for the heat of the meal to come. Salted and buttered Hawaiian rolls helped modulate the temperature, and were also one of the tastiest items on the menu. A salad with a crisp chili soy dressing and silken tofu with a vinegary dipping sauce also cooled our mouths down before a procession of spicy main dishes, starting with a tart kimchi fried rice with poached egg. The slippery shrimp was a particular favorite—these crispy spirals of rock shrimp are bathed in a chili mayo and garnished with walnuts, offering a nice, satisfying crunch along with a sweet heat that continues to burn well after swallowing. Carnitas tacos with salsa verde, radish and a topping of cilantro, onion and lime surprisingly fell flat, with a bland, chewy tortilla suffocating the flavors inside. Choi’s trademark short rib tacos were much better, with the Korean and Mexican spices uniting with a piquant bite. The tamarind black cod hot pot was another success, a warm, mouth-watering stew of fish, glass noodles and spices that capped off our meal but easily could’ve been a feast on its own. The highlight came between the shrimp and the tacos, and deserves a paragraph to itself. Choi’s BBQ spicy pork is a mélange of pork belly and shoulder and the deep red pepper paste known as kochujang, and it’s simply delicious. Tender slices of meat are soaked in a sauce that’s simultaneously hot, sweet, and a little bit salty, resulting in a variety of sensations with every bite. If we ever return to Best Friend, this would be the dish we most anticipated. If we lived in Vegas, or found ourselves there often enough to eat at restaurants we’ve already visited, Best Friend would definitely merit a return engagement. The music can be a little too loud, making it hard to hold a normal conversation, but otherwise the atmosphere is laid-back and relaxing, without either the glitz and fuss of Vegas’s finer establishments or the shopping mall vibe that defines so much of the Strip. The food retains the gourmet informality and innovative multiculturalism Choi’s known for, with the convenience of actually being able to sit down at a table while you eat. And because of Choi’s own background, and the track record he’s established running food trucks and some of the coolest spots in Los Angeles, Best Friend still has a kind of authenticity you wouldn’t expect from either a space that’s so deliberately themed or a restaurant in a Strip casino. It’s a unique and unexpected venture from a resort like Park MGM, and one worth seeking out. Garrett Martin edits Paste’s games and comedy sections. He also writes about travel, food, theme parks and more. He’s on Twitter at @grmartin.